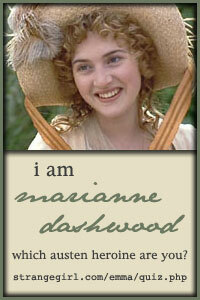 Yes...I believe I was Marianne Dashwood also when I took this quiz. I love all these romantic movies..."aren't they fun to watch!!" I hope all of you enjoyed your 4th, yesterday! We really did! "Absolutely LOVE your CHANGE girl!! Very refreshing to come too, what a lovely surprise!! I adored your other one too, but this gives a refreshing and pleasant look. I am Anna Elliot. That was fun.